New documents reveal, now unleashed worldwide to millions of listeners and viewers on The Alex Jones Show with Mike Adams of NaturalNews, that Monsanto’s genetically modified crops may have actually been planted before USDA approval in 2005. In this exclusive interview, Mike and Anthony discuss the new findings and their implications on giant agriculture and the food industry as a whole. 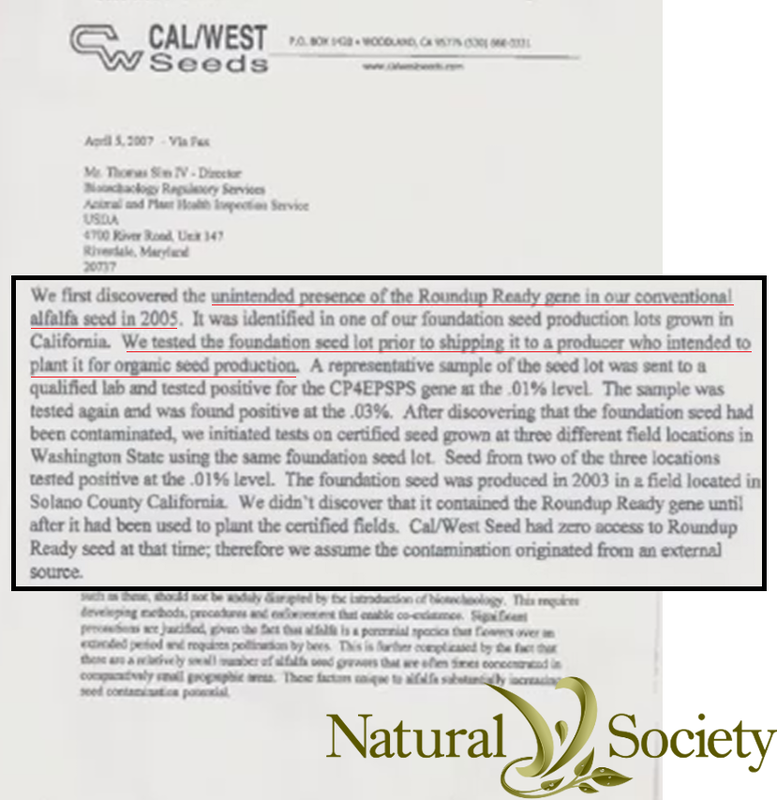 The letter, sourced from Cal/West Seeds company provides direct evidence that contamination was withheld, and the USDA turned a blind eye to proof of contamination in 2005 despite being completely informed of the startling information. Imagine if the TSA had found a passenger carrying a bomb in the airport. Not only would they put the airport on lockdown mode, but they would inspect each and every passenger and launch a full scale investigation. The letter reveals that upon testing, it was found that modified alfalfa has infiltrated the organic seed yet the USDA has done nothing. Instead of a passenger carrying an explosive, this time it is a genetic timebomb that is still ticking! The ‘information period’ regarding the corruption of Monsanto is over. It is now time to take serious action and explain to your neighbor why buying high quality organic foods free of GMOs is the absolute best way to defeat Monsanto. Just like every other corporation, they will fall to consumer demands and a serious lack of customer interest. There is already a pending lawsuit involving OSGATA (Organic Seed Growers and Trade Association) vs. Monsanto. The OSGATA website's "Press Release" tab will inform of the latest about the pending appeal. Good luck trying to sue monsanto the men in black will scare the suers away real fast…. Anthony. It seems that when gmo seed contaminates crops on private property that a case for criminal trespass occurs. A class action (by the impacted farmers) against the perpatrator might provides the funds and attract the appropriate attorney to bring charges against Monsanto. Trying to grow organic food crops is difficult when rivers, air and seed stocks are violated.